This week Microsoft released a toolkit designed to help IT professionals protect systems from common threats. Named the Enhanced Mitigation Evaluation Toolkit (EMET), this little gem is easy to implement, once you install the very small executables on your workstations. Before I walk you through setting up FireFox, I want to take a minute to tell you why you should care about this. SEHOP – Structured exception handling (SEH) chain validation breaks SEH overwrite exploitation techniques. Dynamic DEP – Certain portions of memory are marked as non-executable. Using EMET, you can target specific applications instead of fighting with compatibility issues caused by setting DEP in the BIOS. Null page allocation – Attackers are blocked from taking advantage of NULL dereferences in user mode. Heap spray allocation – Heap spraying involves filling a process’ heap with specially crafted content to aid system exploitation. EMET pre-allocates those memory addresses and blocks these attacks. iexplore.exe (IE) – although there are apparently some problems getting IE to behave all the time. 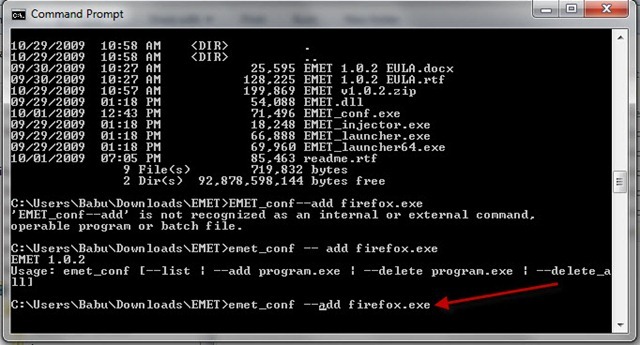 The developers of EMET warn it isn’t for everyone. Since EMET turns off functionality some applications may need to work as expected, it should only be used by IT personnel willing and able to work through possible issues. 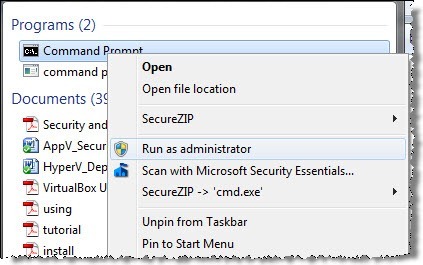 Using EMET starts with a quick download of a .zip file. Extract the file in a folder not generally accessible. This helps prevent unwanted visitors to the target system from messing with them. Type Command Prompt in the search field. Right click on Command Prompt at the top of the programs list to bring up the window shown below. I then followed the simple example in the readme document to protect FireFox, as shown in Figure 2. Pressing Enter resulting in a successful run of EMET. I confirmed this by listing all protected applications. See Figure 3. A new visualization approach to detecting forgeries was presented this summer at EuroVis 2009. Songhua Xu demonstrated how pen angle and pressure provides enough information to determine if a signature, for example, is a forgery. In this image, the signatures at the top are genuine. It is easy to see that what Songhua Xu calls the “lilly” is different and inconsistent on the bottom, forged examples. Supposedly, any forgery is easily detectable no matter how close it “looks” to genuine one. Have you ever wanted to see where a link takes you or whether it actually downloads what you expect? If so, you know there are add-ons for FireFox and other browsers that provide this functionality. However, I just noticed this morning while working within my research SandBoxie sandbox that Google Chrome apparently provides this functionality out-of-the-box. When I hover my mouse icon over a link, the destination or file references appears in the lower left corner of my browser window. Not perfect, but a nice quick-check. Once again, patching isn’t just about plugging holes in Windows. Most if not all applications have security vulnerabilities if someone looks hard enough. Up until now, however, finding those vulnerabilities was harder than just whacking the OS. But Microsoft has settled into a patch release routine that, when followed, pretty well hardens servers and user workstations. And although there are still vulnerabilities, the level of effort required to find and exploit them has become harder—more difficult than shifting focus to widely installed user applications. Adobe is experiencing attacker-love now. They are a good target because their reader is everywhere. Adobe’s software has increasingly come under attack in recent years as hackers have come to realize that it can be easier to find flaws in popular software that runs on top of Windows than to dig up new vulnerabilities in the operating system itself. That’s led to a round of new attacks that exploit bugs in products such as Adobe’s Reader, Apple’s QuickTime, and the Mozilla Firefox browser, for example. It’s a reality that Adobe Chief Technology Officer Kevin Lynch freely acknowledged Monday in a press conference at the company’s annual Adobe MAX developer conference, held in Los Angeles. But Adobe isn’t the only end user application on your endpoints. It’s critical to get ahead of the attack curve by developing an overall patch process today, BEFORE that new user productivity tool becomes a target. Search engine results for download sites offering hard to get or difficult to find popular software are increasingly used by attackers to ply their insidious craft. Users looking for an easy way to circumvent vendor constraints or to find popular free software must practice caution. This isn’t a new warning, but it apparently needs repeating. Surfers also need to be wary about hunting for Microsoft’s new freebie anti-malware scanner via search engines. Websense further warns that scareware distributors have poisoned search engine results so that sites passing off fake anti-virus scanners appear prominently in searches for Microsoft Security Essentials. Both the Google Wave and Microsoft Security Essentials attacks rely on black hat Search Engine Optimisation techniques. Wrongdoers typically break into well-established sites and create webpages stuffed full with relevant keywords, cross-linked to other sites compromised in the same way. The tactic is designed to trick search engines into pushing doctored sites higher in search engine indexes for relevant terms. Two ongoing scams are tricking Google and other search engines into prominently displaying millions of compromised webpages that attempt to hijack end users’ computers or steal their credit card numbers, researchers said. One of the attacks is being used to direct people searching the web to an online store hawking pirated copies of popular software titles. Plugging the phrase “cheap vista for students” into Google, for instance, returned more than 19 million results, many of which redirected users to a site called soft4pcs.com. So if you or someone you know is looking for a free AV scanner or is trying to get their hands on an invite for the newest beta, go directly to the source; avoid second-hand sites unless you are certain they are trustworthy.